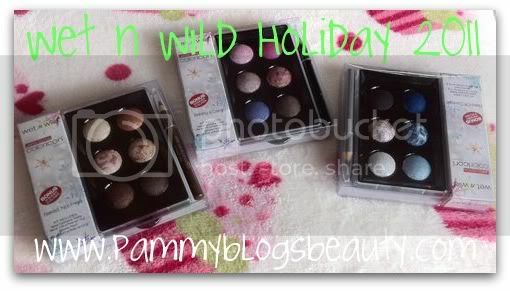 Pammy Blogs Beauty: Wet n' Wild Holiday 2011 Baked Palettes: "Baked Not Fried"
Wet n' Wild Holiday 2011 Baked Palettes: "Baked Not Fried"
My Wet n' Wild Holiday 2011 review series continues with my impressions of the Baked Palette in "Baked Not Fried". Curious about the rest of the Wet n' Wild Holiday 2011 collection (exclusive to Walgreen's)? Be sure to check out my previous posts: Wet n' Wild "I love Matte" Palette Review and Wet n' Wild "Bake Off Contest" Palette Review. So, far, I am have loved all of the Wet n' Wild Holiday Palettes. So, what do I think of this one? Keep reading to find out! At first, I was not going to pick up this palette. I have blue eyes. So, usually I don't want to over-do the matchy-matchy idea of blue eye shadow with blue eyes. Plus, I am primarily a neutrals girl. With that said, I do get in the mood for blue eyeshadow occasionally. 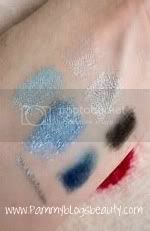 I have many pretty blue eyeshadows in my makeup collection. But, honestly, I didn't have any quite like these. The other selling feature of this palette (for me) was the inclusion of neutral shades. Not only do you get a range of blues, but also a great range of unique neutrals! This was a great idea for this palette. I always like mixing blues with neutral shades. As with the other Wet n' Wild Baked Palettes, my tip is to apply these shadows wet or "damp" (I apply damp by lightly spraying my eyeshadow brush with Evian Spray or Maya Water Facial Mist before tapping the brush to the shadow). When these shadows are applied damp the color and intensity of the shadow increases. When applied damp, the pigmentation is bold. 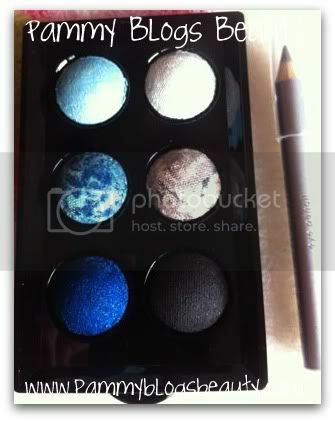 The entire palette has a metallic shimmer finish with the exception of the black which is a matte shade. These shadows wear all day on me without fading. My favorite shades in this palette are the beautiful and unique Silvery Champagne/Taupe/beige metallic shade (middle right), the Sky Blue, and the Medium Metallic Blue. Very pretty!!! I love using the white applied damp in the inner eye corners! Great staying power and it really brightens up your eyes. Overall, I am pleased that I own this palette. While I usually go for neutrals. 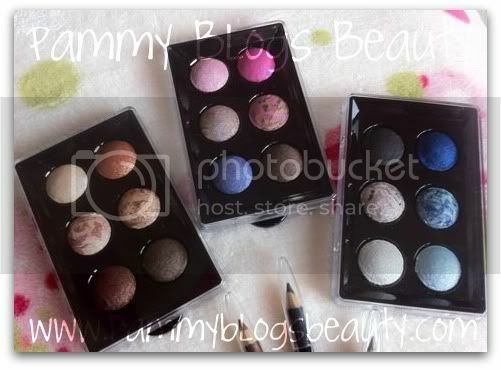 This palette provides a great option for when I want to mix up my look a bit with some color. Plus, there are some great metallic neutrals included as well as a deep black. If you are a fan of cool tones, you are probably going to want to pick up this palette.